For this assignment I used the poem ‘The More Loving One’ by W.H. Auden. Using pr.rhymes, I started by finding words that rhyme with the last word of every 2 lines and created a variable for each. I then substituted those words with a randomly assigned one from each variable/list. The results weren’t coherently consistent throughout but, in my opinion, some of the output was interesting. My next step is using one of the poems I used for a previous assignment, Sylvia Plath’s ‘Metaphors’ and attempt to run a program that changes the words randomly but maintains the same form - 9 lines of 9 syllables. I really enjoyed this week’s assignment, even though I haven’t gotten to a place I’m happy with. It seems I am learning the skills to have more control over my output. I ran many different sources and experiments for this assignment - some of the outputs were incoherent or too repetitive, others I was actually pretty happy with when thinking of the context of the input. Below is the summary of the experiments, troubles and results. When I first started working on the assignment and following the tutorials was playing around with an excerpt from Hunter S. Thompson’s Fear and Loathing in Las Vegas and Anti-Drug Slogans. Nothing really came out of it but I screenshot some outputs I liked. I then moved on to trying to combine the lyrics from Jackson Browne’s (famously covered by Nico) These Days and Graham Nash's Better Days. Because these songs have almost the same amount of lines, similar style (in my opinion, I don’t play music so technically could be very wrong) and similar title names I thought maybe I could get some interesting output. I ran into a few issues. Firstly I kept getting this error. I’m still not quite sure how I fixed it. I added periods to the end of every line in both lyrics ran it again and it worked. I don’t think that was it though so it could’ve been luck..
Then I kept getting these output. I changed the state_size to 2 and it worked, but didn’t return anything interesting. It was the same line over and over again. Because I thought the issue might be that my text was too short, I changed the source to longer texts. I chose Roxane Gay’s manifesto which was later included in her book Bad Feminist (which I loved) and Nora Ephron’s essay ‘A Few Words About Breasts’ published in Esquire. I chose these two texts because I was interested in seeing how they could combine and whether the message (which is somewhat similar in both) would carry on. It was rewarding to see that in some cases it did. It’s a good starting point to creating truly interesting pieces. For this assignment I was inspired by Sylvia Plath’s ‘Metaphors’ poem, which is inspired by pregnancy. It is a single stanza poem of nine lines, each line containing nine syllables with no set rhyme. I was interested in the way she created her own form, focusing on a specific perhaps personal event and both literally and figuratively connecting the two by using different metaphors. The result, in my opinion, feels both very universal and deeply personal. I originally wanted to create a piece inspired by this and my relationship (was celebrating my 6th wedding anniversary on March 15th), I tried different approaches (this is my first creative writing course ever) but couldn’t come up with a result that felt meaningful. Writing metaphors is harder than I thought. Instead, I started with something more simple which, as I expected, has given me a jumping off point to expand and hopefully I can create something more meaningful and complex. I took meaningful years, songs, places and memories and combined them with the intent of shining a light on where we have been vs where we are now. When researching for this assignment, I found myself immersed in reading love letters written by notable authors. I loved the language and emotion that each carried and I started thinking of the role the choice and order of words plays in the meaning or sentiment of a letter. With this in mind, i decided to juxtapose rap lyrics with these love letters and see what would come out of it, how these letters would change. It did not work out. I created to txt files with the content I wanted to juxtapose. I wanted the output to have one line from a love letter and one line from the rap lyrics for a certain amount of lines. I went on a stackoverflow thread (https://stackoverflow.com/questions/16922214/reading-a-text-file-and-splitting-it-into-single-words-in-python) which led me to combining both of my txt files into one. I got here by following the instructions but it wasn’t really necessary. Then I ran the code that I thought would alternate them, but it alternated the whole txt file not by line. 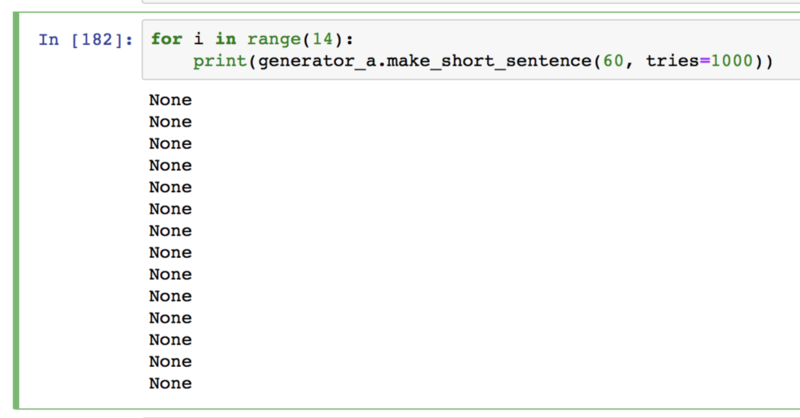 I ran a few different options (below) but none gave me the output I was looking for. I had office hours with Jasmine right before class, who suggested it may be a better way to separate all the lines into two different arrays/strings and then do it that way, which seems more straightforward. Working on that now..
For this assignment I played around with all the poem generator examples we were given. I used the love letter generator along with the words from Bob Dylan’s Thoughts on Woody Guthrie as I thought the mix of such different writing structured might be interesting. However, I decided to go with To Make a Dadaist poem for the final product mainly because I really liked the idea, presented in our first class from How to Make a Dadaist Poem, that stated “the poem will resemble you”. At the risk of sounding ridiculous, lately everything feels jumbled up and I can’t seem to find my way, with anything. It feels a little bit like a ritual or an oracle too (can’t get that class out of my head) but I liked the idea of this randomness giving meaning to what I can’t define. I found the responses reassuring in a certain way, even though some of them didn’t make any sense. cleaning, I'm creative! All I'm am painting I'm quitter. For this assignment, I transcribed a 1961 BBC interview of Sylvia Plath and Ted Hughes. I decided to go for this one because I am interested in the symbiosis or lack there of in relationships between creatives and this interview touches on that subject quite a bit. Additionally, the way the interview was conducted was very clear and structured which allowed me to understand the flow of it and the words better. 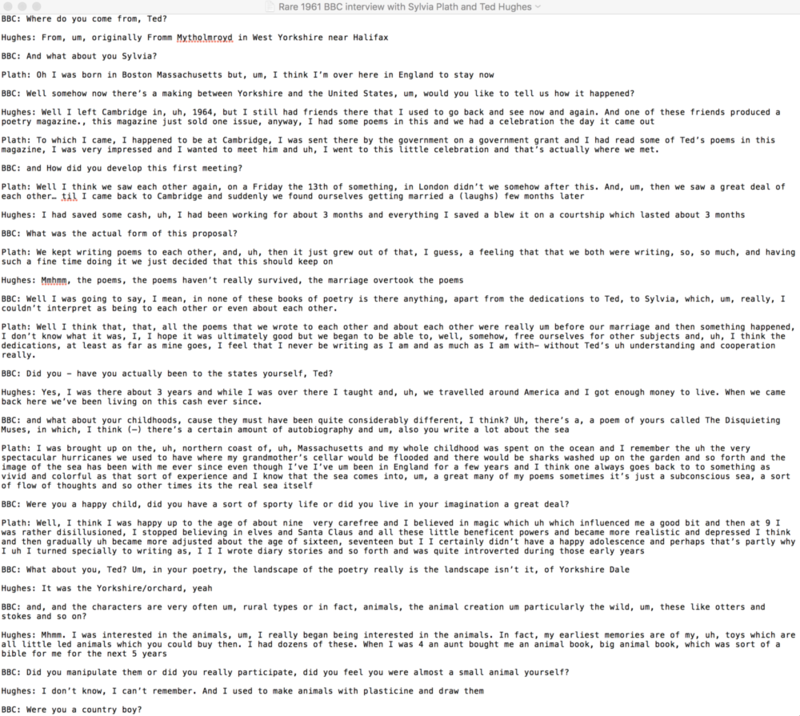 I had tried transcribing a Daniel Johnston and Gibby Haynes interview but it was too fast and I spent too much time trying to understand the words. When keeping utmost fidelity in mind, what I struggled the most with (aside from understanding the correct words— there is a few that I still couldn’t make out) was writing down the phatics (I think that’s what they are?) the umm, ahh, uhh of the conversation. Is that something that should be included in a transcription? How much is lost, if any, when it’s not included? I also struggled with the tendency to auto fill sentences in my head before the person was done speaking.. Even though the overall meaning or intention of the words were correct, it was still not exactly the same. I kept going back and switching words around to make sure fidelity was met as much as i could. BBC: Where do you come from, Ted? BBC: And what about you Sylvia? BBC: Well somehow now there’s a making between Yorkshire and the United States, um, would you like to tell us how it happened? Plath: To which I came, I happened to be at Cambridge, I was sent there by the government on a government grant and I had read some of Ted’s poems in this magazine, I was very impressed and I wanted to meet him and uh, I went to this little celebration and that’s actually where we met. BBC: and How did you develop this first meeting? BBC: What was the actual form of this proposal? BBC: Well I was going to say, I mean, in none of these books of poetry is there anything, apart from the dedications to Ted, to Sylvia, which, um, really, I couldn’t interpret as being to each other or even about each other. Plath: Well I think that, that, all the poems that we wrote to each other and about each other were really um before our marriage and then something happened, I don’t know what it was, I, I hope it was ultimately good but we began to be able to, well, somehow, free ourselves for other subjects and, uh, I think the dedications, at least as far as mine goes, I feel that I never be writing as I am and as much as I am with- without Ted’s uh understanding and cooperation really. BBC: Did you - have you actually been to the states yourself, Ted? Hughes: Yes, I was there about 3 years and while I was over there I taught and, uh, we travelled around America and I got enough money to live. When we came back here we’ve been living on this cash ever since. BBC: Were you a happy child, did you have a sort of sporty life or did you live in your imagination a great deal? BBC: and, and the characters are very often um, rural types or in fact, animals, the animal creation um particularly the wild, um, these like otters and stokes and so on? BBC: Did you manipulate them or did you really participate, did you feel you were almost a small animal yourself? BBC: Were you a country boy? Hughes: Mmm yes. Mytholmroyd isn’t really a village but the country comes right down on it, on every sign and uh, my brother was a great one for wandering about with a rifle and in fact he was uh, he did little elves and he used to take me along as a sort of retriever. BBC: What was the line of your progress from there to Cambridge? Hughes: Well then, uh, we left Mytholmroyd when I was about 8 and all that we sealed off we moved to — which was industrial and depressing and dirty. Well at the time, it was all very unhappy but it was all a very good thing. Um it became, it became a much richer experience for me than my previous 7 years had been and it being so different it really sealed off my first 7 years so that now I have memories of my first 7 years which, uh, my first 7 years seems almost half of my life. I remembered almost everything because it was sealed off in that particular way, it became a sort of brain, another subsidiary brain for me. And anyway I went to Mexico grammar school and uh, I wasn’t very interested in any lessons, but I was writing and the teachers seemed interested in my writing so this, I gradually concentrated absolutely everything on writing. It began to seem possible that through my writing I might go to university and get scholarships and so on. BBC: Would you say that, uh, your temperaments are parallel or do you seem they are in conflict in the sense that uh it’s a marriage of opposites? Hughes: I think superficially we are very alike. We like the same things. We live at the same tempo. Have the same, sort of, um rhythm in um almost every way but obviously this is a very fortunate covering for temperaments that are extremely different. But they live secret lives, you see, they content themselves in a, in an imaginative world so they never really come into a conflict. Plath: I think our (—) life is practically indistinguishable from all the people who live around us the only main difference is that Ted doesn’t go out to work at 9 and come home at 5. If he retires about 9 to his room and works but I certainly have a life like the housewives and mothers in our district, shopping dishes and taking care of the baby and so forth and I think very few people have an idea I do anything at all except uh household chores and so on. BBC: Where do you live? Plath: Really by Primrose Hill Zoo, that’s one of the reasons we like it so much, we’re always going to the zoo with the baby and so forth. We can hear the seals barking in the summertime. BBC: How much room have you got to live in? Plath: Oh, not enough (laughs) We have a very small flat, uh, a bedroom, a sitting room, a kitchen and a bar which is a uh, rather juggling feeling when it comes to managing a 9 month old baby and uh we’re dreaming of a house I can shout to Ted from one end to the other and he won’t be able to hear me but I don’t know how far away that is. BBC: Did you find it necessary to keep yourselves separate from each other? Hughes: I can write with people in the room quite easily. BBC: Well they say that 2 can live as cheap as one but even so (laughs) it must be quite expensive. Have you got jobs outside of writing? Hughes: No, not at present. We had in America. Where we both taught. Plath: and then I was a secretary for a while and I always can take up a secretarial job or a part time job if we get close to starving or if I seem a (larder’s?) to bear or something to that effect, but we’re quite flexible since both of us are able to work and have worked together and then (—) so uh the circumstances have allowed us to. BBC: But would you have it any other way? BBC: Has the baby made a big difference to the running of the house? Hughes: Before. Like a cat, only much better. BBC: At what stage are you going to start introducing the child to actually listening to poetry? Plath: She already is listening to nursery rhymes which I consider poetry. I don’t believe in being self conscious about it. That everything from uh little nursery rhymes and songs to Elliot’s practical — what is it? Practical cats is perfect material. BBC: I take it you can’t continue to draw on your childhood memories and so on for your poetry. What is the more continuing source, continuing inspiration for the writing you’re doing now? Hughes: Well apart from the experiences of your own life, my experiences in my life, I also have in uh in a way, Sylvia’s experiences of hers and all the experiences that she’s had in the past. It’s like um, uh, a medium who is an automatic writer, you know? Just on a pad. And watch you write it need not be a doll, the contest of her own mind, need’nt be anything she knows but it’s something that someone in the room knows of somebody that she’s very close to now and in this way, two people are sympathetic to each other and who are right, who are compatible in this sort of uh spiritual way, they in fact make up one person, they make up one source of power which you both use and you can draw out, uh, you can draw out material in incredible detail from this single shared mind and I’m sure that this is suddenly a source of a great deal in my poetry I don’t know whether it works the other way around, I suspect it does. It’s not that you choose the same things to write about necessarily, and you certainly don’t write about them in the same way. It’s that, you, uh, you draw on an experience as though you knew more about something than you from your own live have ever really learned and in fact it seems, from what I’ve seen of this, that you’re drawing also, I’m drawing also on my wife’s knowledge of it. BBC: It’s a very hard thing to put into words, isn’t it? Hughes: Yes, a complicated idea to get across because you first of all, to believe that this sort of telepathic union exists between two sympathetic people which of course a lot of people don’t believe. BBC: Is that how you would’ve put it? Plath: Me, well, I think perhaps I’m a little more practical about it not quite so abstract. I can give an example. For instance, Ted’s interest in animals made me look back into my own life and my father, among other things, was a biologist and happened to keep bees. And I, oh I didn’t much about this time but I’ve become very interested in bee keeping and the image of bee keeping has become part of my poems and I think this is a direct result of knowing Ted. Somehow I know more about my own past through him than I would otherwise. But I’m also influenced by art, by paintings and sculptures, a lot of my poems describe paintings and take of from a visual image and go on from there. Plath: I’d like to know how you think the poems are alike, because this is something that no one else has ever, ever remarked on before and I’ve always thought that our subject matter in particular, and also the form in which we write, the forms, are really quite different and I’m interested to know where you think the coincide. Plath: Well I think this was too in our poems really before we knew each other or met each other and uh in that sense we would probably be alike, if we are at all alike, whether we had ever encountered each other and so I don’t think this is a result of our meeting, it’s something that went on before I mean we were writing for 10 years before we ever heard of each other. Hughes: I think it’s something we share with several other writers too. Several other people writing now. Plath: And the kind of toughness and naughtiness that we admire, both of us, I think, again, it’s something we both have always, always admired and perhaps that’s why we, um, we met in the first place. Because we both felt that we had the similar interest. Hughes: Whenever we do happen to write about a similar thing, the main, uh the interesting thing about it is how differently we do treat it and how differently we approach it. Hughes: And mine is what’s left when a pig has disappeared. In other words, what’s left of a pig when the pig is no longer a pig, when it’s a dead pig and in a way this is a, this is the complete um reversal of Sylvia’s theme. BBC: Does music play a part in your lives? BBC: A good way to crown off this conversation would be to let the listeners hear a poem from each of you.